We’re sliding into testing season (except it’s that long, slow, shallow kind of slide with spikes, barbs, and razor blades along the way). You dread it. They dread it. Even your #2 pencils dread it; they were made for writing, after all, not bubbling. Students need exposure to the types of questions they’ll face, but there are ways to practice that are–dare I say it–engaging. Heaven forbid they actually learn while practicing. 1. Post large letters around the room corresponding to the number of answer choices on the multiple choice practice. So, there will be ABCD or ABCDE taped to the walls and file cabinets. 2. Give students a short set of multiple choice questions that are written in the style of the actual test. These might come from a benchmark, a released exam, or materials created by teacher authors. WARNING: If you choose to purchase multiple choice practice, find out the question-writing experience of the authors. A good question writer understands design, answer order, stem quality, and most importantly–how to write a FOIL answer. In a five-answer format, there is typically one answer that can be eliminated fairly easily, two answers that a good reader can eliminate, and a foil, that almost-correct choice that trips up our students. 2. Once students have completed the questions, have them all stand in the center of the room. 3. For the first question, each student quickly moves to the letter corresponding with his or her answer choice. 4. At each station, students with that answer confer about their reasoning for choosing that letter. Tell students that you will call on one random person to explain the answer, so everyone needs to be ready. 5. Go around the room and call on students to explain the answers. You can make this step interactive by having students from other groups question the student who is presenting. 6. Explain that students may change groups whenever they wish. If they find that they are unable to defend a choice, they may even stand in the middle of the room until they hear a well-defended choice. Students LOVE this option. The movement will become competitive, and students will start trying to win converts. 7. Once all four (or five) groups have presented, most students will be in two groups, the correct answer and the foil. Let those two groups choose spokespeople and duke it out in a debate. Why do I love this strategy so much?? Strong readers are modeling their thinking for weaker readers. As a weak reader, I need to hear the think aloud of someone’s reasoning. I need to hear the text used to defend an answer choice. I need to hear someone else’s process of elimination. Do I grade these exercises? I actually do. Students need a little skin in the game to take their presentations seriously. For a low-stakes daily grade, I offer points for each one the student got correct even if he or she switched groups after hearing others’ defense. 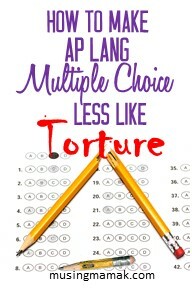 For lots more ideas for AP English Language & Composition multiple choice, take a look at this collection of resources.